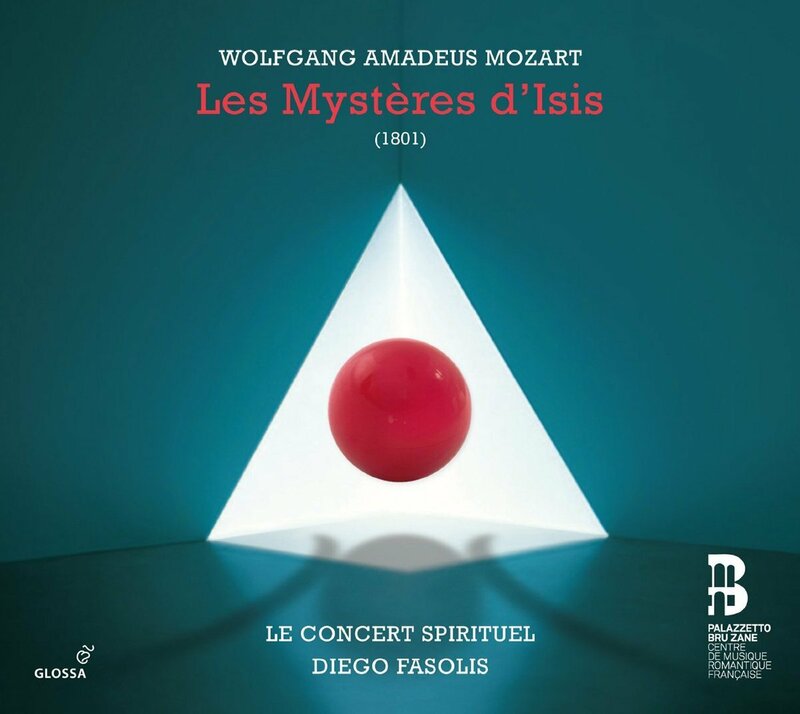 No, Mozart did not write an opera called Les Mystères d'Isis, and no, this isn't a straightforward French version of The Magic Flute. Instead we have a pasticcio created in 1801 by Ludwig Wenzel Lachnith with a plot which owes something to The Magic Flute and music from that and other Mozart operas. The work is performed by Diego Fasolis, Le Concert Spirituel, the Flemish Radio Choir with Chantal Santon-Jeffery, Marie Lenormand, Renata Pokupic, Sebastien Droy, Tassis Christoyannis and Jean Teitgen. The recording is issued on the Glossa label and supported by the Palazzetto Bru Zane, who prepared the score. If we have little more than a pasticcio, then why record the piece? Perhaps because it represents and interesting and in some ways important landmark. By 1801 Paris had heard very little Mozart opera. Le nozze di Figaro (in French with Beaumarchais' dialogue) disappeared after six performances in 1793, and Die Entfuhrung aus dem Serail was performed just three times in 1798. Apart from an odd aria, The Magic Flute had not been heard at all. Though the Académie Royale de la Music was in it incarnation as the Theatre de la République et des Arts, it still adhered to the old guidelines and as a work without ballet and with spoken dialogue, The Magic Flute was unsuitable. But the fad for all things Egyptian following Napoleon's Egyptian campaign (1797-1801) made the idea of the opera attractive. Free adaptation of foreign works in Paris and in London was common in the early 19th century. Carl Maria von Weber's London commission for Oberon was due to his popularity through free adaptations of Der Freischütz, a work which reached Paris in the form of Robin de Bois. And Berlioz famously took on the task of adapting Der Freischütz for the Paris Opera because he feared someone else making a bad job of it. But Lachnith took a very free attitude to The Magic Flute, not so much adapting it as using the score as a quarry to create a new work suitable for French theatrical tastes. Lachnith as a Bohemian composer and horn player who had moved to Paris in 1773 to study horn, and composition (the latter with Philidor). After the overture we launch into music from the second act of the original opera. There are excerpts from La clemenza di Tito, Le nozze di Figaro and Don Giovanni. Myrrene (the Queen of the Night figure) is now a mezzo-soprano and makes her entrance to Donna Anna's first aria from Don Giovanni and later in Act Three sings Vitellia's Non piu di fiori from La clemenza di Tito. She does not sing the Queen of the Night's famous second aria. Don Giovanni's Champagne aria becomes a trio. Music from The Magic Flute pops up in strange places and unrecognisable contexts, Pamina even gets some of the Queen of the Night's music. All is linked together with new recitative. All the characters are present, but renamed, apart from Pamina, and the relative balance changed (the Papagena character is expanded). Well, the work is an important example of the changes in tastes, as an historical document it is invaluable. Frankly, it is as interesting as any work by a third rate composer recorded because of its contemporary influence. And Les Mystères d'Isis is genuinely important and influential, it kindled the taste for Mozart's operas in Parisian audiences so that at the Theatre Italien Le nozze di Figaro was performed 196 times between 1807 and 1824, and Don Giovanni received 109 performances between 1811 and 1831. And in fact, listening to it is rather fun; you never know what is going to come next! The performance is entirely admirable with Tassis Christoyanis as a delightful Bochoris (Papageno) with Marie Lenormand as Mona his Papagena figure, Jean Teigen as a dark voiced Zarastro (Sarastro), Chantal Santon Jeffery as a poised Pamina and Sebastien Droy as an Ismenor (Tamino) not far from the haute contre tradition. Renata Pokupic compensates for the strange re-write of the Queen of the Night character by singing her new music beautifully. The CD booklet includes the full text and translation (and you'll need it if you want to follow the barmy new plot) and an admirable article by Etienne Jardin and Alexandre Dratwicki. But the one lack is a breakdown of what bit of Mozart goes where. That would have been and ideal aid to listening to the fascinating testament to a change in taste.